If everyone else is doing it, why should we? We try to stay true to ourselves and make the beers we want to make and like to drink. We produce a wide range of beers in our 20-barrel brewhouse, including lagers, stouts, Belgian style beers, barrel aged beers, and the occasional sour. But our true specialty and passion lies in hoppy beers. We strive to make Pale Ales and IPAs that highlight the full expression of the hops while retaining low bitterness and excellent drinkability. All of our beer artwork, unless otherwise noted, is created by the talented Nick Fullmer. Like his work? Our warehouse walls host the artwork of four talented artists. 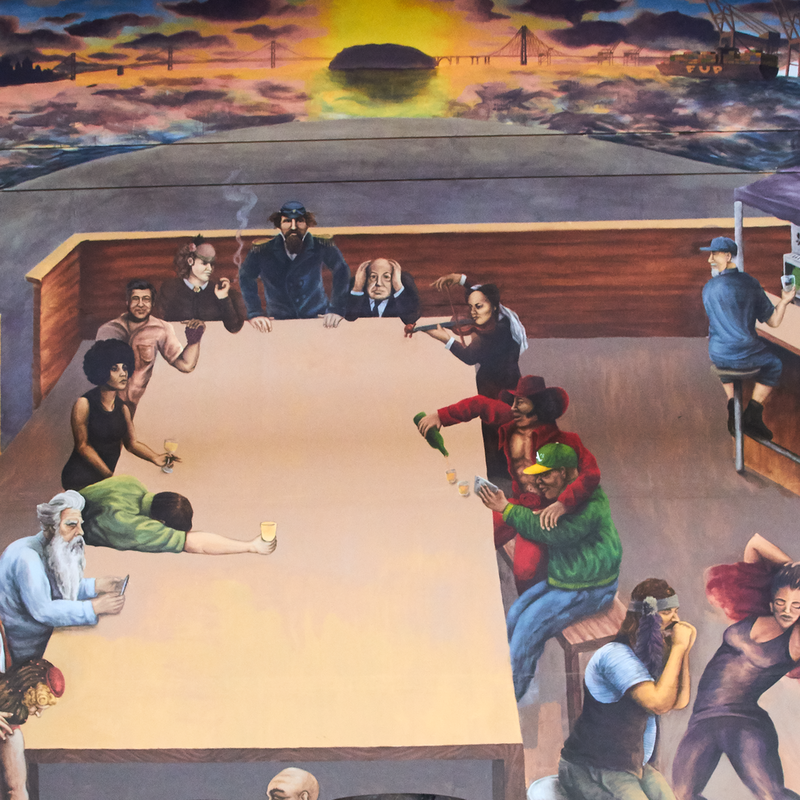 These images are cropped for size...please come see the murals in their full glory in person! Rodger Davis and Claudia Pamparana opened Faction Brewing in September of 2013. Rodger has been a part of the West Coast Craft Beer scene for over 20 years. Originally a Southern California native, Rodger received his certificate in Brewing Science from Siebel Institute of Technology and World Brewing Academy in Chicago. Before opening Faction he was the Head Brewer at Drake’s Brewing in San Leandro and Triple Rock Brewery in Berkeley. Rodger enjoys drinking Underbergs, listening to Africa by Toto on repeat, and giving people the middle finger. Claudia grew up in Southern California and received her Bachelor of Science degree in Business Administration from Boston University. She spent many years as the face behind the bar and manager at 21st Amendment Brewery in San Francisco. Claudia enjoys landscaping, drinking Penske, and telling Rodger to knock it off. All photography by Audrey Kuhn except front page image by Brian Gogo, Forward and Craft Photography . This site was designed by Anders Howerton. Want to be the first to hear about new beers and events? We promise not to overload your inbox.